This is the time of year when, again, birds start gracing our presence. I’ve spied yellow and gray goldfinches drinking from the birdbath and large black crows chipping ice out if it in the early morning or dipping crusty bread into the melted water. Within the lattice of our naked burning bush I’ve spotted a male cardinal perched like some ripe crimson apple waiting to be plucked. A black and white speckled flicker taps staccato on a scaly branch just outside the window from my desk. Yesterday, while walking Rudy on a wooded path we found ourselves surrounded by chirping sparrows and warbling catbirds—the exotic sounds of spring in Maine. These sweet songs reminded me of a favorite movie I recently watched with my sister, To Kill a Mockingbird. The classic 1962 black-and-white film stars Gregory Peck as small town attorney Atticus Finch, and is based on the novel of the same name by Harper Lee written a few years before I was born and that I’d enjoyed reading in junior high. Gazing down at the bark trail I regarded my untucked plaid shirt and dirty jeans. I thought how, in many ways, the film’s wiry six-year-old tomboy, Scout, reminded me of myself at that age, even sharing the same pug nose, mine turned up with a permanent crease from habitually wiping it upwards with the heal of my palm. While watching Scout scamper around in her pixie haircut, denim overalls and canvas sneakers I had quietly relived my childhood days of exploring nearby woods with my brothers, climbing into their homemade tree forts, digging up old bottles and rusty treasures and playing hide-and-seek. I remembered the time my brother Scott got shot in the leg with a BB gun at close range and how I thought the silver bead looked odd embedded in his muscular thigh like a pit in peach flesh. I remember when my daddy gave me that gun. He told me that I should never point at anything in the house and that he'd rather I shoot at tin cans in the backyard. 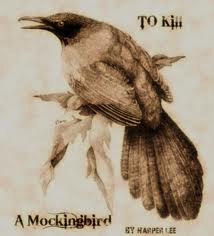 But he said that sooner or later he supposed the temptation to go after birds would be too much and that I could shoot all the blue jays I wanted, if I could hit 'em; but to remember it was a sin to kill a mockingbird. Why? Well, I reckon because mockingbirds don't do anything but make music for us to enjoy. Don't eat people's gardens. Don't nest in the corn cribs. They don't do one thing but just sing their hearts out for us. Somehow that scene made me think of my son Calvin. He doesn’t—can’t—get into too much trouble. Doesn’t bother other kids or pets. Doesn’t cause mischief. He just grunts and coos and giggles (and screams at times but that's the drugs) and gives us hugs and kisses and smiles and then some more hugs. Our little Calvin ... he’s like a song. A few years back I heard part of a story on national public radio. It was about a single mother (my friend prefers the apt term “head of household”) raising a severely disabled child with the help of government funds to aid her arduous and expensive responsibility. A caller remarked on air about how much he resented his tax dollars funding what he coined “a lost cause.” His words stung and made me think about some countries that, perhaps even today, might systematically euthanize kids like Calvin or, at least, choose to let them wither and die. What makes a life valuable? I thought. Surely the caller had never known or valued—or loved—a child like the one he’d have society abandon, a child like Calvin. In the film a kind soul had been anonymously leaving Jem gifts and trinkets in the knotted hollow of an old tree: a tarnished pocket watch, two carved soap figurines resembling Scout and Jem, a medal. That same kind soul saved the children’s lives from a menacing stalker one dark night while the two kids walked home on a wooded path. Their hero was Boo Radley, the “simple-minded” recluse neighbor who’d been secretly watching over the motherless children all their lives, keeping them safe, keeping them in his heart, secretly bestowing precious gifts upon them. Upon discovering her humble protector shyly cowering behind a door, Scout sweetly likened silent Boo—with his rumpled clothes, pekid complexion, dark sunken eyes and tussled hair—to a mockingbird. Calvin is our mockingbird, I thought. And I hope he keeps singing for a long, long time to come. Beautiful! I remember it--loved it then, love it now.